Bi-folds are the flavour of the month – pick up any magazine, particularly window and door trade magazines – and they are dominated by adverts for these products. Designed initially for use in masonry openings, they have been adopted ‘lock, stock and barrel’ for conservatories. The concerning feature of this – and the adverts that feature in the trade magazines to generate interest – is that the images in the adverts nearly always show them in buildings and not in conservatories( a quick examination of one issue of a trade magazine revealed 8 display adverts and only one that showed their use in conservatories). The concern is this – do these fabricators and resellers of doors truly understand the structural and fitting requirements of bi-fold doors in the more challenging circumstances of conservatory builds? Those tempted by adverts like those shown alongside in the panel need to clearly understand the additional structural implications – it’s not just about battering your door supplier for a better price!! Let me declare an interest on behalf of Ultraframe. As it does by providing sealed units, Ultraframe likes to provide a one stop shop and it’s no different with it’s provision of aluminium bi-folds. The doors are available in a variety of panel configurations (2, 3, 4, 5 and 6) and widths and come in white as standard, although other RAL colours are available. 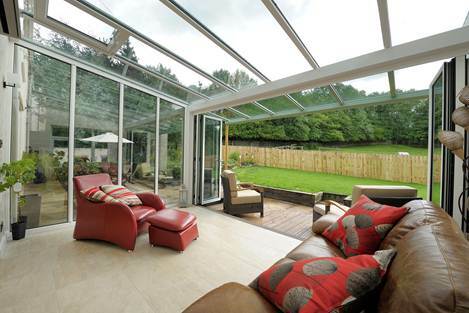 Doors are glazed with a 28mm sealed unit and feature a centre pane ‘U’ value of 1.2.The bi-folds Ultraframe sells are specifically designed to be used in conservatories, where deflection of the beam above is a fact of life. The doors Ultraframe sells can handle a maximum deflection of 7mm without catching. Some bi-folds being offered for use in conservatories are not designed for conservatory use, but to sit inside lintel supported masonry where deflections are minimal – in these situations, you should check with the door system company or selling fabricator. To ensure that its doors never bind or catch, Ultraframe recommends its recently introduced Super Duty Eaves Beam- incorporation of this product into the early design gives you integral support rather than as a bolt on ‘after the fact’ necessity when things start to deflect and the doors are binding!! When fulfilling the demand for these bigger openings conservatory retailers need to take account of the increased loads that bear onto these longer spans of eaves beam. As a pioneer in the conservatory industry and a dedicated roofing specialist, Ultraframe has always strived to produce technically elegant solutions that ensure the structural stability of a conservatory, even those which are fitted with bi-fold doors. The standard Classic system eaves beam can be upgraded to the Super Duty Eaves Beam - it sits 38mm taller than its standard product. The great news for fitters is that it goes together in the same way and interfaces with the wide range of Classic system box gutters and the Gable Frame Support Beam. The renowned R&D team at Ultraframe have worked hard to create this ‘beefier’ solution but what is it’s performance like? Take a typical 4m width Georgian with 4-16-4 units and in a 0.6 snow load area - the Super Duty Eaves Beam allows opening spans of up to 3600mm with a maximum deflection of only 7mm compared to 2300mm for the standard beam – so significantly enhanced spanning performance is delivered with a controlled deflection that bi-folds made to Ultraframe’s specification can cope with. Mark Hanson, Marketing Manager at Ultraframe, commented: “We appreciate why consumers want bi-folds – they perfectly fit into their dream of the creation of multi functional rooms. But – what we as an industry must ensure – is that the consumer doesn’t get fobbed off with an ill considered design that creates problems down the line. The new Super Duty Eaves Beam from Ultraframe addresses the need for wider openings - in the majority of instances - in a way that is both cost effective and simple for fitting teams. Goal-post portal frame arrangements may carry out the required task – and in exceptional circumstances are still required - but they are time consuming to design, costly to manufacture and may require additional skills on site for them to be fitted.”. The Super Duty Eaves Beam is available on Classics purchased either through local Fabricators/Distributors or on roofs built at Ultraframe`s own factory. A 12-page technical specification guide is available to assist retailers in the correct design and specification of these larger openings. The purchase of doors with an attractive headline price – the trade magazines are full of them – may end up costing a retailer more in the long run as the retro fitment of a steel beam to cure a deflection problem will be costly and will result in a disgruntled home owner. To request a quote for Ultraframe’s door and beam combo on your next project contact your local Ultraframe fabricator/distributor or the quotes team at Ultraframe on 0843 208 6941. Ask for the 12 page guide which will help with the correct design and specification of these larger openings.